Google Plus has a Secret Crush on Google Ads. I recently ran up to this banner from a Belgian energy provider. I am a bit puzzled. Is it a good thing to give a commercial message value? Does this positively relates to the Google mission? Impact of +1 a Google Ad? The +1 is sign to Google that you like that particular piece of information. Content that receives lots of plusses appear higher in search rankings. Is the ability to +1 an ad a tool for Google to further improve their ad targeting practices? How do you feel about the ability to +1 an advert? Google Adsense: why should you consider it? If I ask people to “just name a brand”, then I often get the answer “Google”. Yes, Google is a powerful brand these days. Nevertheless, people often know nothing more about Google then it being a search engine. Of course, Google is much more than a search engine. Just think about the apps “Google Earth”, “Google Maps”, “Google Video” “Google Docs”, “Google Calendar” and last but not least “Gmail”. It’s clear that Google isn’t just a search engine. But how do they generate revenue then? Google introduced an innovative business model – AdWords – and the pay-per-click (SEA) concept. The new business model proved to work because today AdWords is still the main source of revenues of Google Inc. The powerful element in the Google business model is the fact that advertisers are ensured their ad appears only when people are interested. 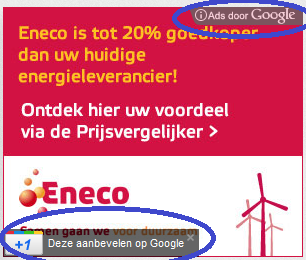 A search engine ad only appears for relevant keywords (in the case of the pay-per-click model). People only enter keywords when they are explicitly interested in a subject. An Adsense ad only appears in between relevant content. This means the ad is advertising the same good or service as the page it is on. Bottom line: advertising via a Google platform is cost-effective since it only reaches people who are interested. Compared to “mass advertising media” such as television, this way is much more effective. Have a look at the below screenshot of this website. It’s an Adsense ad that was placed next to an article on “brand management”. For a company specializing in brand management, appearing next to an article like that is very useful since the reader of the article is already interested in the advertiser’s core business. AdSense’s innovative targeting options allow advertisers to more precisely reach their desired audiences on a third-party website — resulting in more revenue for the third-party website owner as well as more sales for the advertiser. AdSense ads are related to the content of the webpage. This is an advantage: your ad pops up there were it doesn’t interrupt. It fits in between the content on the website. An advertiser can target a site based on demographics, vertical, geographic location, or URL. An advertiser can show ads based on users’ interests and previous interactions with that advertiser.